They’re sticking to the adjective-as-title thing. Enchanted, Tangled, Frozen. Oddly, these Titles for the Too Impatient to Read a Full Line generation represent the studio’s best films in a long, long – well, ever. In a rare move for Disney, the bad guys do not die, which leaves a gaping, unsatisfied hole where the dual protagonists’ parents end up. The villain is not the typical Evil Incarnate character, but he still has it coming after repeated attempts to murder both of our heroines. I’m not one to pander for violence, but narrative payoff is something else entirely. Finally, a Disney movie that is unabashedly feminine. Both the protagonist and the deuteragonist are women. The goofy love interest is a bit of an afterthought, and the princess’s naive dreams of true love are subverted when the handsome prince turns out to be a ruthless manipulator. By the time Anna (Kristen Bell) meets someone she actually likes, she’s matured, and doesn’t allow the film’s epilogue to be a grandiose wedding with the supporting characters stupidly grinning in support. Different is good. Elsa (Idina Menzel), the elder sister and by far the most interesting character, is born with the uncontrollable ability to create ice and snow, with which she nearly kills Anna during a childhood game. When she becomes Queen, she can no longer hide her powers, which cause her to be ostracized and exiled by the homogenized population of Arendelle. But her reaction is not to wish that her condition could somehow be “fixed,” and not that the superstitious minds of her kingdom would welcome her back. She realizes (during a soliloquy-style song, naturally) that the only person she needs to be good enough for is herself. What a move for Disney, whose narratives about women mutilating themselves and otherwise conforming to suit the standards of other people will never live down the harm they’ve caused. Thankfully, plenty of time is spent alone with Elsa, and what was undoubtedly originally planned as a one-dimensional Snow Queen antagonist turns out to be the most sympathetic, misunderstood underdog of the bunch. There’s a lot of talk about “an act of true love” being the only thing that can heal a frozen heart. Barf, I know. 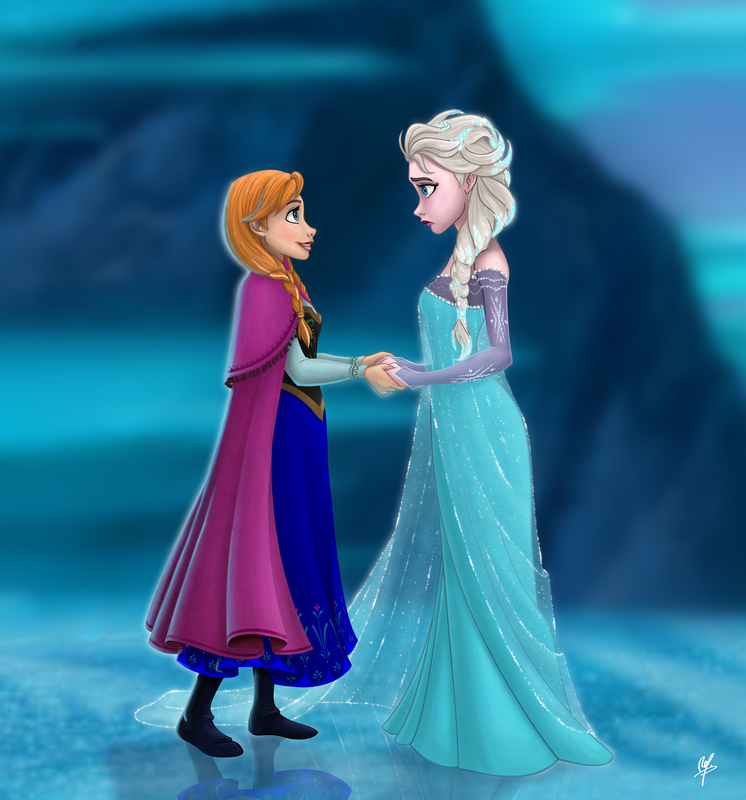 But wait – the final act of true love does not turn out to be the much-expected “true love’s kiss” between Anna and her chosen beau; it’s Anna’s decision to save Elsa’s life in spite of the entire kingdom wanting the latter dead, and Elsa’s subsequent weeping as she throws herself over her sister’s icy form. The whole film rides on this moment. What a relief. My one regret about the above is that with a single miniscule adjustment (removing the sibling-hood and making Anna and Elsa friends), this could have been a story about two women who love each other. Well, it is, but I mean romantically. Anna’s relationship with Kristoff (Jonathan Groff) is so shoehorned in that there’s no time for it and it feels synthetic. Maybe Disney isn’t ready for a gay princess, but everyone else is. With the studio’s first black princess a few years back, and the first truly women-centric story in their history, a gay Disney narrative could provide so much in the way of healing. But Frozen is a positive step. Most of all, it’s gently done. 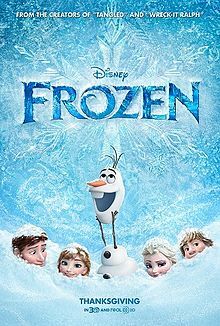 Frozen (2013); based upon The Snow Queen by Hans Christian Andersen; screenplay by Jennifer Lee; directed by Chris Buck and Jennifer Lee; starring Kristen Bell, Idina Menzel, and Josh Gad. With The Princess And the Frog, the Disney company did an arguably successful recall to the classic animated musicals many of us watched a million times as children. Most of these, as we know, are Disney’s version of popular European fairy-tales or, quite often, the “Disney-fying” of historical material. Their latest effort, Tangled, feels like a Disney classic with CG coating. Tangled is a reimagining of Rapunzel, a fairy-tale first penned by the Brothers Grimm (which is itself an adaptation of Mademoiselle de La Force’s Persinette), in which a young girl with enchanted hair is taken at birth by a witch, Dame Gothel, from her parents, and sealed in a tower. The girl is eventually discovered by a prince, who proposes to her, and despite Dame Gothel’s efforts, the two escape and live happily ever after. Rapunzel is perfect Disney fodder. Dame Gothel, given the German name of “Mother Gothel” and played by Donna Murphy, provides all the allegory we need for a film like this. She is the overprotective parent. She encourages Rapunzel (Mandy Moore) to “let down her hair,” but only as far as this will serve Gothel’s needs, and never lets Rapunzel leave the tower. Rapunzel herself is a character I admit to being surprised at: ever barefoot (a purity/innocence motif) and classically “rebellious” but also fun to spend time with. Her voice is never shrill, ignorant or unwelcome, and her transformation from blonde to brunette in the end is a bit of a switch for Disney. Trying to make up for ages of hair-ism, perhaps? (Though you can’t entirely blame Disney; the Brothers Grimm were committing these acts of atrocity toward women with “imperfect” appearances long before the dawn of film). The new characters, including Prince Eugene (Zachary Levi), secondary villains the Stabbington Brothers (Ron Perlman), and a singing thug with a hook (Brad Garrett), provide the necessary cast backbone to make the story not only a successful fairy-tale, but also a watchable and engaging adventure. Music-wise, the film more or less delivers. A few of the songs radiate the obnoxious teenie-bop and hip-hop vibe which will be eaten up by kids who are currently the age I was when The Lion King was released, but the “Healing Song” Rapunzel repeats until we memorize it and “Mother Knows Best,” the vintage Disney bad-guy-bolero, are thoughtfully composed. As of January 1, 2011, Tangled is the second most expensive film ever made, and is, appropriately, a better film than the one just above it on that list (though it was made by the same company). It conveys a sense of “moral” as do the Grimm fairy-tales and every Disney cartoon before it, but this “message,” if we can say one exists, seems to be aimed more at pre-parents than the children themselves. I’m hoping the children, at least, can leave this film with a wide grin. Tangled (2010); written by Dan Fogelman; directed by Nathan Greno and Byron Howard; starring Mandy Moore, Zachary Levi and Donna Murphy. Because I can read minds! With the above, we get a Nicolas Cage gem to rival that of “Not the bees!” (which, despite its popularity, is not even featured in the final cut of The Wicker Man remake). What we get with this film is a bit different. Jon Turteltaub and Doug Miro’s (and six other writers’) reimagining of the Dukas poem, the Goethe ballad and the Fantasia short cartoon, is aimed at a strictly PG audience. Only one scene is reminiscent of the older Disney film (the sorcerer’s apprentice animating mops and buckets to clean up his mess and the disastrous results that follow), and most of the humor is material I would have found hilarious as a ten year-old. The film does have its charm, however. Choosing Baruchel as the proverbial “chosen one” is somewhat inspired, as are several other characters. Well, one other character: Drake Stone (Toby Kebbell), a secondary antagonist in a movie with way too many bad guys. Kebbell gets to have fun with this role, parodying modern flash-artists who give illusionists a bad name (i.e. Criss Angel), and easily stealing the show. Alfred Molina also stars as Horvath, the main baddie, who unfortunately remains fairly one-note throughout. Par for the course in a film made for children. But is it good for children? I’m not sure. Early on, Molina hurls a knife through a windshield and kills a guy. Later, he murders a twelve year-old girl (albeit off screen). I dug this stuff when I was younger, if not for anything but the laughs generated from annoying people getting theirs, but I’m curious as to what this onscreen behavior in a film with a very specific audience is advocating. Sure, Molina plays the “evil” character, but everyone wants to play the “bad guys” in Hero Quest, don’t they? Is Hero Quest even in print anymore? Probably a rhetorical question. 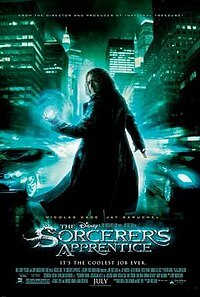 Ultimately, The Sorcerer’s Apprentice is clumsy film-making; the plot contains more holes than a Lorraine Swiss, the editing is choppy (as though the editors were rushed to shorten the film), and the characters are nothing more than the usual suspects in a film of this type – except Kebbell, who seems oddly out of place with his East-end accent and fourth-wall-breaking lines, including “These aren’t the droids you’re looking for,” (a throwback to the original Star Wars) which gets the film’s biggest laugh. Despite all that, Cage plays his role with the usual enthusiasm and seriousness, and the audience can never once doubt that he at least finds great importance in this story’s action. It’s a good time at the movies, with the obligatory post-credits hook for a sequel (which doesn’t quite make up for the amount of unresolved plot details). 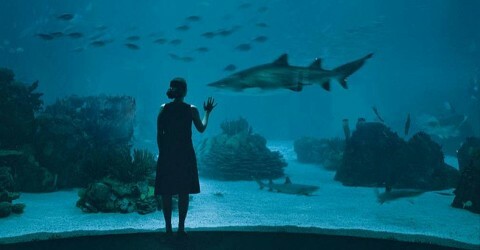 Worth seeing with kids or good-humored friends? Definitely. I did have to shake my fist at the Product Placement Gods, however, when Cage brings to life a stone eagle perched atop the Chrysler building and flies it into the night…in four different scenes. The Sorcerer’s Apprentice (2010); written by Doug Miro; directed by Jon Turteltaub; starring Nicolas Cage, Jay Baruchel, Alfred Molina and Toby Kebbell.